Wounded world champion Jason Crump stormed to victory in the FIM Otomoto.pl European Grand Prix in Leszno, but admitted he had not expected to launch his title defence until June. The Aussie tore from the tapes to win a re-run final ahead of local favourite Jaroslaw Hampel and Russian starlet Emil Sayfutdinov. Crump was unsure whether he would start the 2010 season after suffering severe burns and broken bones in a crash at Belle Vue last September, which nearly cost him the 2009 championship. But the 34-year-old declared himself fit to race in Leszno and cruised into the semi-finals with 10 points from his five heats. He then led a determined Sayfutdinov home to reach the final, before producing a classy tapes-to-flag triumph to top the rostrum. Crump’s success clearly left the Aussie international baffled. He was surprised he even raced at the Alfred Smoczyk Stadium, let alone won the meeting. The SGP championship leader said: “I didn’t expect to be here today, so it was a bit of a bonus really. “At the end of last season, I thought I would be able to start defending the World Championship in about June if I was lucky. He added: “I can run, but I can’t really lift anything heavy with my left arm. I’ve had a lot of support from a lot of people – my wife, my family and a lot of other people who have stepped up and helped me. So I’m very fortunate and I’m really happy to be here. “I’ve always put a little bit of pressure on myself to be the world champion, and I want to try and win again. Hampel, who made his SGP return after a two-year absence, also kicked off his season with a bang. He topped the heat scorecharts with 11 points, before pushing the Aussie all the way in the final. Third-placed Sayfutdinov bagged 10 points in his heats, but was unable to keep up with Crump and Hampel from the tapes in the decider. Wild card Kolodziej made a great impression on his Polish Ekstraliga home circuit with 10 points, before bagging second place behind Hampel to secure a spot in the last four. But his night was ended when he lifted and collided with Sayfutdinov going into turn three in the first staging of the final. Referee Krister Gardell excluded the Pole from the re-run. Three-time world champion Nicki Pedersen will have been disappointed with his start to the campaign after scraping through to the final with eight points, before missing out behind Crump and Sayfutdinov. 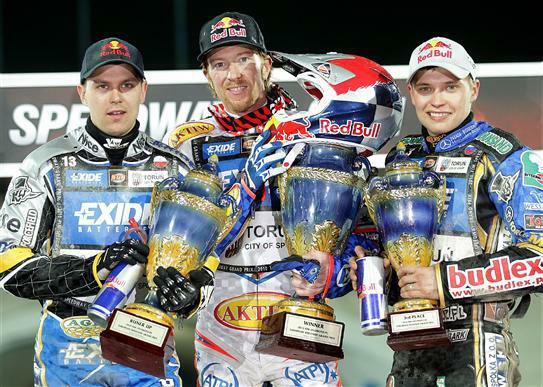 Kenneth Bjerre (10 points), Rune Holta (9) and Briton Chris Harris (8) made positive starts to their SGP seasons. But Freddie Lindgren, Hans Andersen and Chris Holder will have been gutted to miss the semi-final cut on countback, despite scoring eight points apiece.